OXFORD, Miss. – Science has revealed several fascinating things about lightning. For instance, a lightning flash can heat the surrounding air to temperatures around 50,000 degrees – five times hotter than the sun’s surface. Lightning bolts roar toward the ground at speeds of 200,000 mph. And an American has about a one-in-14,600 chance of being struck by lightning during an 80-year lifetime. 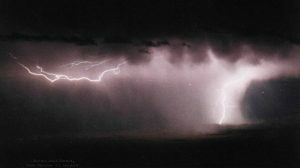 Questions remain about lightning, though, including how lightning starts, and that’s a secret two University of Mississippi professors are working on unraveling. Two recent National Science Foundation awards will assist the scientists – Thomas Marshall, professor of physics and astronomy, and Maribeth Stolzenburg, research professor of physics and astronomy – as they pursue the mysteries of lightning initiation. Knowing how lightning begins could lead to a better understanding of where it might strike and being able to better warn people of approaching weather conditions conducive to lightning strikes. Marshall and Stolzenburg are not working on predicting lightning strikes, as the first question to answer is: How does lightning initiate? “We’re going to try to get a better understanding about how lightning starts, and then how it moves through the cloud,” Marshall said. “But the starting part is especially interesting because air is not a conductor and when you see the big, bright … return stroke of a lightning flash, that’s a big current and it needs a good conductor. 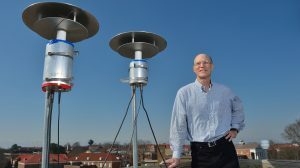 Marshall is principal investigator of an award that is for $154,222 for its first year and titled “Lightning Initiation and In-Cloud Electromagnetic Activity in Mississippi Thunderstorms.” Stolzenburg is the co-principal investigator for the award, No. 1742930. Expected future NSF support for the award is $95,419 each year in 2019 and 2020. The second award is titled “Collaborative Research: High-Speed Slitless Spectroscopy Studies of Natural Lightning Flashes” and is for $154,476 for its first year. Stolzenburg is principal investigator for the award, No. 1745931, and Marshall is co-principal investigator. The award is a continuing grant with an estimated total award amount of $440,314. The second project is a collaboration between Ole Miss and Texas A&M University professor Richard Orville and will collect new lightning data, including high-speed video data and lightning spectra. The first award allows the duo to analyze data collected in the spring and summer of 2016 in north Mississippi, also funded by the NSF. That award was granted after Marshall and Stolzenburg conducted lightning studies at Kennedy Space Center in Florida in 2010 and 2011. In the summer of 2016, lightning data was collected at seven sites in north Mississippi. One of the sites was at the UM Field Station, and another was on the Ole Miss campus. The data collected is some 20 terabytes of computer memory, enough to max out the storage capacity on about 312 iPhone Xs with 64-gigabyte storage capacities. The lightning data is on a time scale of less than one-millionth of a second. The second award will collect new data on lightning initiation using three high-speed video cameras and the seven sensors. The data collection will focus on the initial sparks (with durations of only 5- to 60-millionths of a second) that occur during the time needed to form the lightning channel, roughly the first 3- to 10-thousandths of a second of a lightning flash. The video cameras will record the initial pulses as they develop. “Essentially, we are trying to understand all this fine detail in the lightning data to see if it fits with the theories of how lightning starts,” Stolzenburg said. “Or, if it doesn’t fit, then there is something wrong with the theory, so we need to modify the theory. According to the National Oceanic & Atmospheric Administration, from 2006 through 2017, 376 people were struck and killed by lightning in the U.S., with almost two-thirds of the deaths involving outdoor leisure activities such as fishing, being on the beach, camping, boating, or playing soccer or golf.